▲ On April 8th, President Han and students representatives are having a conversation at Lotus Hall. The scheduled meeting between the general students and President Han Tae-sik (Bogwang) at Main Auditorium was not accomplished on April 8th. Instead, student representatives including the General Student Council and the Student Councils of each department had a short meeting with President Han at Lotus Hall. Previously, President Han postponed the meeting from March 29th to April 8th. Yet, only a few days before the meeting of the 8th, the school announced that only the student representatives will be allowed to participate in the interview. Meanwhile, the GSC criticized the schools’ repressive measures on members on campus. On April 6th, Professor Han Man-soo who was accused of committing assault on another professor was found not guilty. Despite such judgment was made, school is still keeping its stance on his dismissal as well as on the accusation on students. ▲ An Dre, the chairperson of the GSC is stressing their stance on the approval of President Han Tae-sik regarding the meeting on March 29th. The school’s oppressive measures against the members of campus are continued. The school sued its students in charge of reputation damage. In addition, it dismissed Professor Han Man-soo from Department of Korean Language and Literature and Creative Writing for the reasons of criticizing the school. 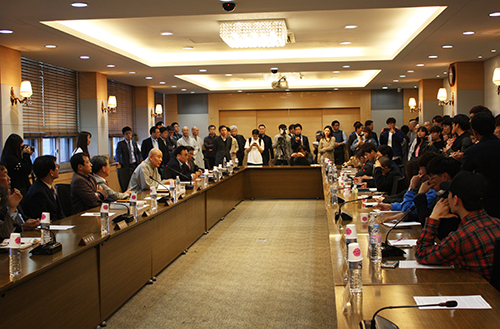 Members on campus demanded a meeting with President Han Tae-sik (Bogwang), but it was not made in its entirety. On March 18th, Dongguk University accused four students of defamation regarding President Han and the Jogye Order. The four students charged by the school are An Dre, the chairperson of the General Student Council (GSC), other two chairperson and a student in Dongguk Promotion Committe for the Future (DPC). They are indicted on a charge of posting disparaging contents of the school. The contents which the school claim to be disparaging were distributed in front of Sanglokwon and were posted on Facebook on March 17th by the DPC and the GSC. They included images that drew virtual dialogues in a Kakao Talk chat room named “Koreana Hotel Lunch Crew.” Bogwang Sunim is known to have attended such assemblage in Koreana Hotel in reality, which the GSC assumed to be the beginning of intervention of the Jogye Order on the president election. They covered contents that imply an inappropriate transaction between President Han and Jaseung Sunim over the position of the president. Previously, on March 15th, Professor Han was dismissed from Dongguk University in a teachers’ disciplinary committee. The school’s grounds for taking disciplinary action are the followings: Spreading negative public opinion in terms of the chairman of the board of directors and the president Direct slander on the university Physical violence against his colleague. Regarding the first ground for the school’s disciplinary action on Han Man-soo, it nominated him as a subject who instigated the students to protest against the school. However, the DPC maintained that it was their independent decision. Holding a negative stance toward the board of directors and President Han was not due to anyone’s instigation but was from the students’ voluntary will. On April 6th, Professor Han was acquitted of the assault that he has performed a violence on his colleague. The Seoul Central District Court judged that he is not guilty for the physical violence case. Previously, the prosecution had indicted Professor Han demanding one million won in fines. Professor Han commented, “The sentence of innocence was taken as justice prevails,” right after the announcement. Furthermore, he showed his expectation of reinstatement. He had filed an injunction to invalidate the dismissal. On the same day at 1:00 P.M., the GSC also conducted a press conference in front of the Main Hall. 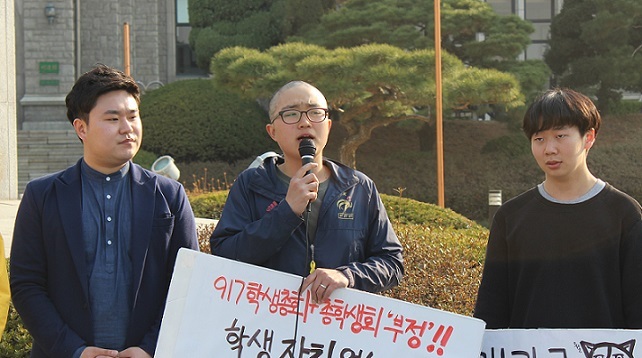 The chairperson An, mentioned, “We stopped spreading the articles as soon as the school made a complaint,” and added, “I do not understand how the school could sue their students.” He shaved his hair to express his stance. After the press conference of the GSC, President Han tried to move by his vehicle, but students blocked the way of the car in which President Han was. Students demanded President Han to get off the car and have a conversation with them. The physical conflict continued for the next two hours and finally, President Han promised to have a meeting with students on March 29th. In spite of his promise, he did not appear at the appointed place. The official reason was that his health condition got worse and the school announced that he would have a meeting on April 8th. However, there is a growing controversy on the fact that President Han was present at the proclamation ceremony of a campaign called “To Be like a Buddhist” on the day he missed the appointment with students.